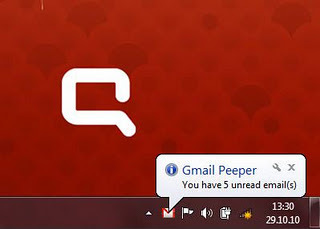 Gmail Peeper is a free Gmail desktop notification application for Windows. Using this Gmail desktop notifier application you will get instant new email alerts from desktop. 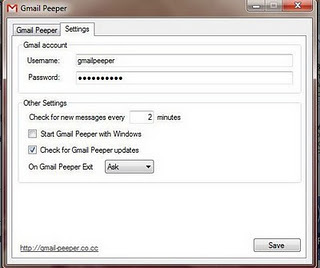 Gmail Peeper is a small utility which sits in your system tray and notifies about new emails. It also shows the number of new emails in pop up window. First download and install this freeware and you will see an icon in system tray when it’s running. First you need to provide your Gmail account credentials to use this Gmail desktop app. The configuration of Gmail Peeper is very simple, you can set the time interval for checking new emails and you can enable or disable the system auto start option. This software will show the number of unread emails in your mailbox. This Gmail desktop alert software works on Windows XP, Vista and Windows 7. You need to have .Net framework 3.5 to run this software. Can it work without internet connection? Yes, you need active internet connection to get new email notifications.